EuroMat®, one of the most popular and versatile ground mats in the industry, has been added to Ground-Guards’ growing portfolio of ground protection solutions. Manufactured from 100% recycled high density polyethylene (HDPE) and weighing just 35kg, EuroMat can handle loads up to 80 tonnes. 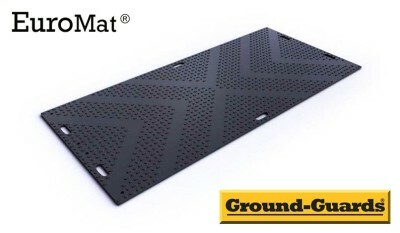 EuroMat is the essential ground protection mat for light-medium duty construction, civil engineering and ground work industries for both short and long term projects. It is an ideal solution for a wide range of applications including temporary roadways, work pads, depot storage areas or pedestrian access and delivers vital protection to sensitive ground for example sport fields, golf courses, park land and landscaped areas. Please click here for more information on EuroMat; its features, benefits, technical specifications and photos. To access Ground-Grounds’ full portfolio of ground protection solutions please click here.